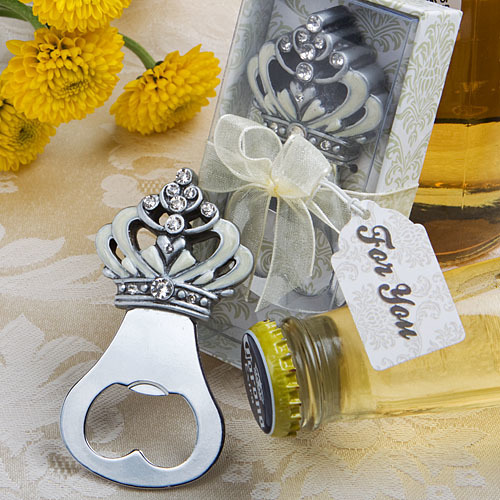 Your guests will love receiving these crown party favors! Gorgeous to look at, practical and convenient to carry. Adorned with faux diamonds, each crown bottle stopper measures 3" x 1 3/4". The silver metal bottle opener base is topped with pewter colored poly resin crown that features an ivory enamel inlaid design. That's not all! Your crown favors arrive very attractively packaged in a showcase box with a beautiful pale olive and ivory damask designed bottom. It is then tied at its center with a white organza ribbon and has an attached matching design “For You” tag.